The girls aren’t too crazy about stuffing, and I still had a bit of stuffing in the freezer from our trial run, so we had this instead. It was pretty good! Heat the olive oil in a pan and sautee the onions and garlic until fragrant. Add the musrooms and cook until they are just starting to brown. Add the rice blend and stir to coat rice with oil. Add the chicken broth and cook at medium heat and cover. Cook for 10 minutes, then lower heat to low and simmer for 15 minutes or until you are ready to serve. That’s going on the menu tonight! I’d give you 5 stars for your cooking and another 5 for the way you teach and feed your daughters! Hi FishFish, thanks for visiting! 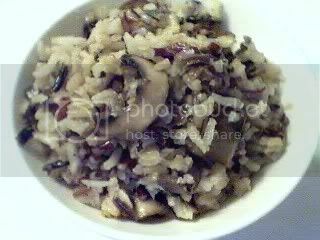 Wild rice is the dark brown, long kernels in the picture. It is a variety of weed, I guess pretty similar to rice, but more fibrous. It has more of a bite to it, and provides great texture to the dish. The one I used here came pre-mixed with the brown rice and red rice. Wow! This seem like a great and healthy rice for me. Wat is a wild rice btw? Hi Drstel, I had the same problem, and I only cooked a 13 pounder. Yours was twice as big! I used a stockpot, and the tips of the legs were kind of sticking out. Glad to hear you had a good Thanksgiving. Sounds like you did a lot of cooking. P.S. I made your Brussels sprouts but I overcooked it! wahh. (Guests were at the door). I still ate it all hehehe. You’ve presented your menu so well!. Have a nice long weekend…shopping ba?